Click on a region of the map to read about alumni in your country. 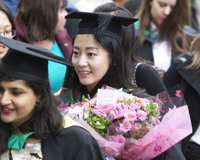 Whether you studied as an international student, or are now an ex-pat Nottingham Trent graduate living overseas, you remain a valued member of our alumni community – and these web pages are for you. Whichever country you live in now we would like to keep in touch with you, and help you keep in touch with each other. As you visit different areas of the map, should you notice that your country of residence isn't listed, please update your details as it means we're not aware of any alumni in that area. There are now a number of official alumni ambassadors who help us run networking groups in countries around the world. These groups help former students keep in touch with each other and up-to-date with what is happening at Nottingham Trent University, as well as providing networking opportunities in each country. See the list of official alumni ambassadors and informal groups.